About a week before Fountain Pen Day I was watching The Pen Habit, Matt Armstrong’s YouTube channel, and he mentioned the Delta Journal. It was a super quick reference as he was reviewing a different pen, but my ears perked up. I had never, ever heard of a fountain pen called The Journal, and as the author of this blog I had to investigate. So yes the initial motivation was purely the name but ultimately the pen has proved to be so much more than that. I started my research on YouTube and I couldn’t find any video reviews of this pen. (If you find one please let me know!) I couldn’t believe it. There are lots of Delta pen reviews, but none of The Journal specifically. So then I went to online retailers. Goldspot carries them, and so does Stilografica. I also found them at Giardino and Pen Chalet. All of them were around $320 US ($426 Cdn). [Note: when I was researching this pen earlier this month they were closer to the $500 Cdn mark.] I thought I would check ebay as well and the prices were considerably better. One of the sellers, Martemodena, had a lot of product and great reviews. So I decided to go straight to the source. Martemodena has their own website so I decided to order from them directly. They were offering this pen for $120 Cdn, which is quite a savings. And as I write this they are offering the pen for $102! I don’t mind, I couldn’t wait to get it so I paid the going price. But at that price maybe I need a second one……..! The more reviews I read and the more pictures I saw of the pen the more I wanted it. The Journal was made to honour journalists and freedom of speech, which appeals to me as I took my undergraduate degree in Journalism. I placed an order on Thursday and received the pen the following Wednesday. Shipping was extremely reasonable: $15 US. Excellent packaging. The Delta box. Fine Writing Instruments since 1982. The faux leather box. Almost there! A stunning presentation. The box is lined in cream suede. Along with the pen there is a bottle of Delta ink (blue) and information cards, including the serial number (this pen collection has numbered editions), the date of inspection and the initials of the inspector, along with guarantee information (lifetime, with conditions) and filling instructions. This model is a cartridge converter-filled pen. I chose the Pearl Red finish, which is red resin with green and grey flecks. Each pen is hand-made from Italian resin. The trimmings are rhodium plated, as is the nib. Delta offers a “fusion” nib which is gold and steel but I chose the rhodium plated steel. I don’t think the extra cost for the gold nib is warranted in these pens, as the gold doesn’t actually touch the paper, so the benefit is negligible, in my opinion. Even though it came with ink I chose Harmonious Green by Waterman. Waterman is always safe and I wanted to match the barrel somewhat. I forgot to take a picture but as I said previously this pen takes international cartridges but also comes with a cartridge converter. The converter actually has a steel top that is accessible from the bottom of the barrel. So it can be filled without unscrewing the barrel. It saves a few seconds but I usually unscrew the whole thing so I can see how much ink has flowed into the reservoir. Here’s a closeup of the nib and that beautiful resin. I chose a medium, even though European mediums tend more toward broad than medium. But I didn’t want to risk a fine nib being too fine. This nib is perfect. Smooth with just a touch of toothiness. The nibs are available in Extra Fine, Fine, Medium, Broad and Stub. This numbered edition is number 4768. I like how the name of the pen is inscribed on the cap. And at the very top of the cap we see Delta Italy. I did the writing sample above in my Executive Journal. No bleedthrough. Some ghosting. You can see how the line leans more broad than medium but I like that. 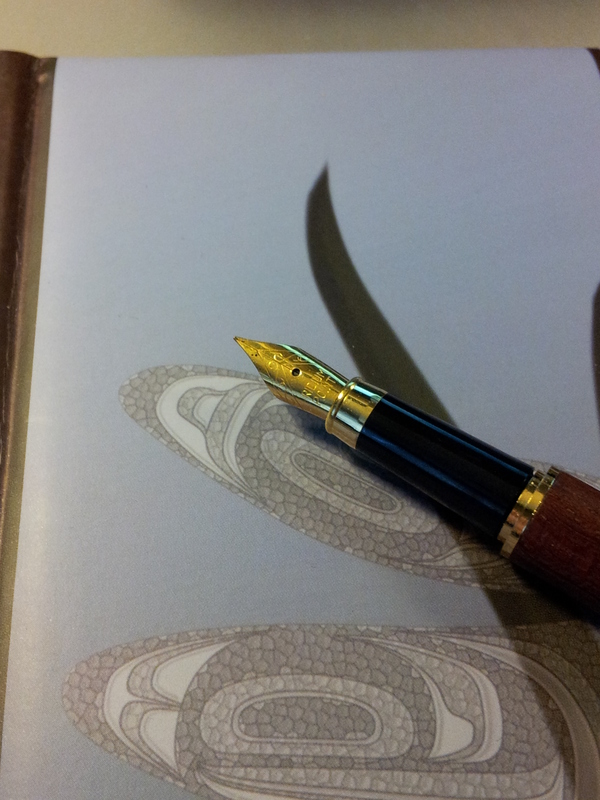 It performed well on the Tomoe River paper in my Seven Seas writer as well. The pen arrived super quickly from Italy. They used DHL and what an informative website they have! I watched it go from Bologna, Italy to Leipzig, Germany, and then to Luton, UK and then to Heathrow, where it was put on a plane to Canada. Four business days from start to finish. Impressive. The clip has a ball at the end, which turns, for ease of placing in a pocket, apparently. The section is just about 1 cm wide, which I love. The concave shape fits my hand perfectly. The pen is 13.5 cm long unposted. Even though I love to post I try not to do it with this pen, for fear of marking the resin on the barrel. 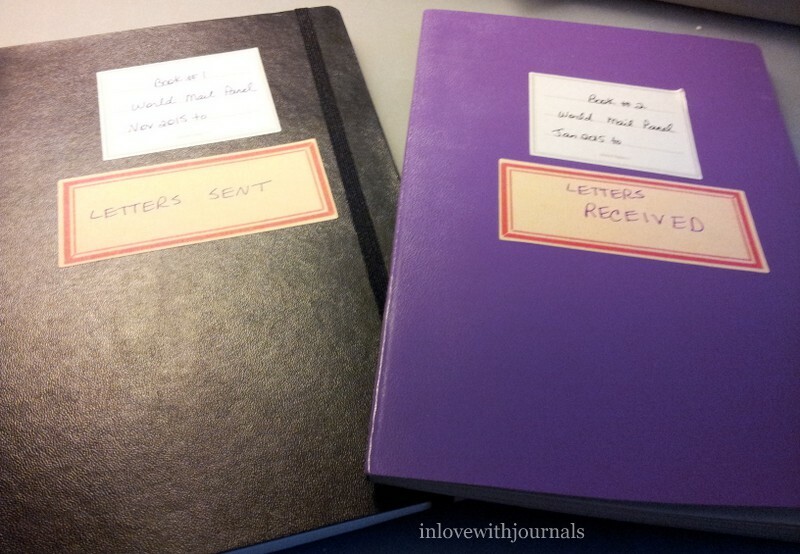 There is another version of this model, called The Journal Grande, which is much thicker, and the clip is different. Happy Fountain Pen Day 2015! 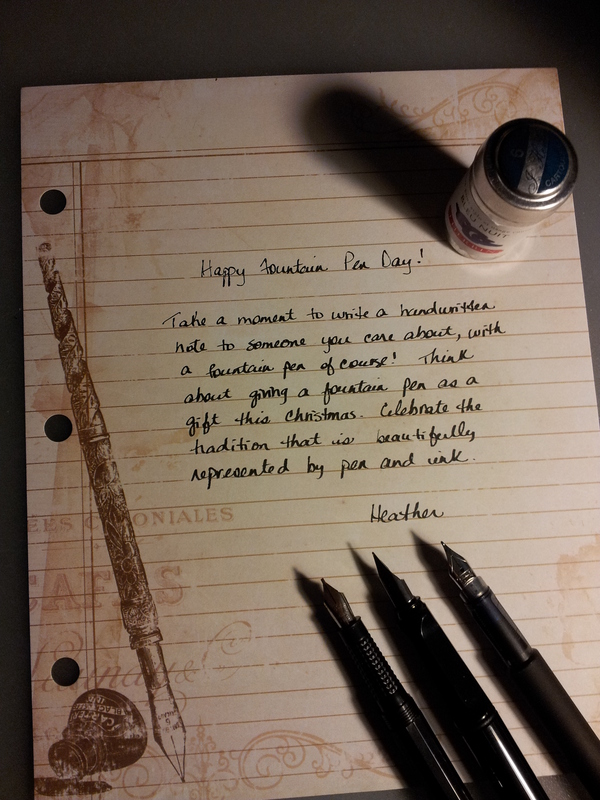 Hope all of you have a wonderful day using and loving your fountain pens! Be sure to check out http://www.fountainpenday.org/ for ideas on how to celebrate and don’t forget the sponsor page; lots of great deals and giveaways. Have fun! Fountain Pen Day is coming up on Nov 6 and to celebrate Pen Chalet is offering some goodies. Check out all of their fantastic giveaways here. And don’t forget to order something on the actual day; Pen Chalet will have a special coupon available for use on all of their items. The countdown is on! If you want to spend a few minutes gazing at beautiful pens, check out Bespoke British Pens, a fairly new company who bought out Conway Stewart last year. Expensive but absolutely wonderful to look at and dream about. Of course I was drooling over the (very) limited edition Conway Stewart William Shakespeare pen! Wow. Hand-painted Romeo and Juliet. Amazing. And check out the Jack Row pens – mind-boggling, in appearance and price. And I’ve mentioned them before but Knight’s Writing Company has graciously included this blog as a Friend of Knight’s Writing Company. I am in esteemed company indeed and very proud to be a friend of this great Canadian pen, paper and ink retailer. I’m touched Graeme, thank you so much!! My specific type of sciatica was diagnosed this week so I can finally research the correct exercises and get that moving. My back is better but I’m still dealing with a lot of pain. Hopefully the stretching will help that. I did not know that raisins are toxic to dogs and cats. Thanks to a friend’s experience (one I hope she never has to go through again) I understand how deadly this innocent-looking fruit can be. I’m glad I made her week bright again by giving her a fountain pen on Fountain Pen Day. 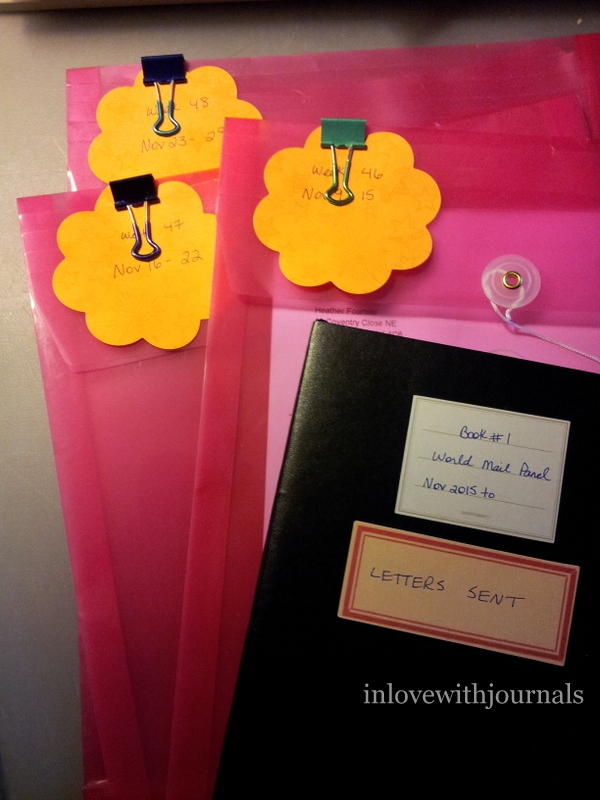 I LOVE this post on Sharing Our Notebooks by Penny Kittle: My Writing Notebook is Always With Me. 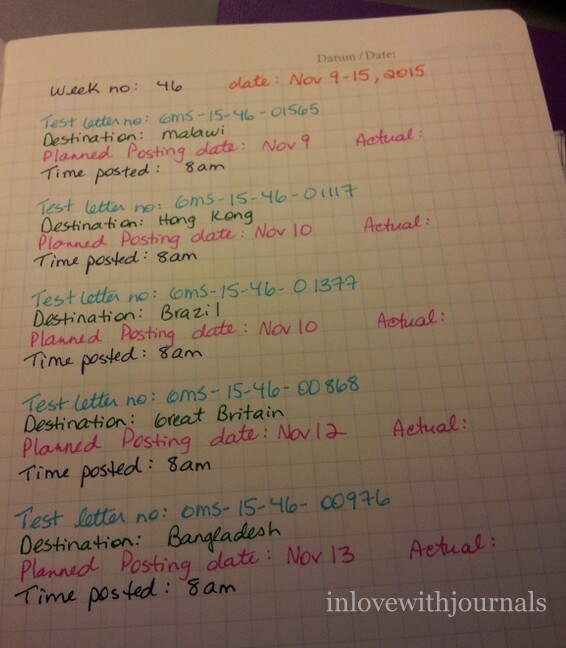 The picture she shares of her notebook shelves remind me of my own, although I am still in the multi-coloured phase of my notebook accumulating. And don’t miss the charming video; it’s a must see for journallers and wannabe journallers. Fantastic stuff. If your body carries a soul, your notebook should carry your mind. And finally if you haven’t seen SBRE Brown’s Fountain Pen Day video, head over to his blog right now and watch it. The herald and champion of our deep-rooted love of fountain pens has done it again. And enter the giveaway while you are there! Check out all the fun on fountainpenday.org and be sure to click on the Sponsors link for a list of goodies being offered around the web!